Distributed solar PV prices continued to see a rapid decline through 2017, according to the latest edition of Lawrence Berkeley National Laboratory’s annual Tracking the Sun report, published last month. But the study cited prices well above those recorded by other researchers. According to the report, national median installed prices for residential solar in 2017 were $3.70 per watt (DC), representing a $0.2 cent per watt, or 6 percent, decline from the prior year (all figures in watts-DC). Non-residential solar systems clocked in at $3.10 per watt, representing a $0.40 per watt, or 11 percent, decline. Installed prices for large non-residential systems last year were $2.2 per watt, down $0.10 per watt, or 5 percent, from 2016. Through the first half of this year, the LBNL study tracked an additional $0.10 per watt decline in residential and small non-residential system prices, and effectively no change for large non-residential systems. Prices varied greatly based on size and location. 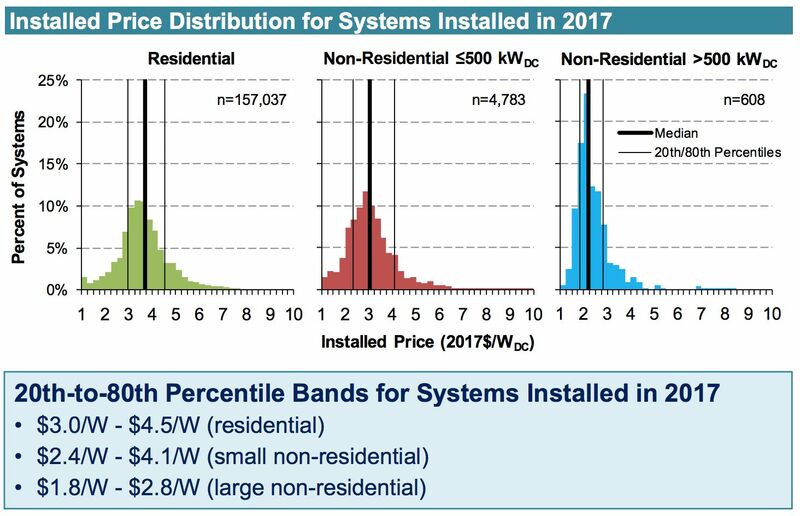 LBNL found state-level median installed prices in 2017 ranged between $2.60 and $4.50 per watt for residential systems, between $2.20 and $4.00 per watt for small non-residential systems, and between $2.10 and $2.40 per watt for large non-residential systems. System type also played a role. For instance, one customer-owned residential solar system was logged at $9.60 per watt. “These are national numbers; they're the medians within a very, very large number of data points. So when you look at the spread, there's a huge spread,” said Galen Barbose, research scientist at LBNL and an author of the report. 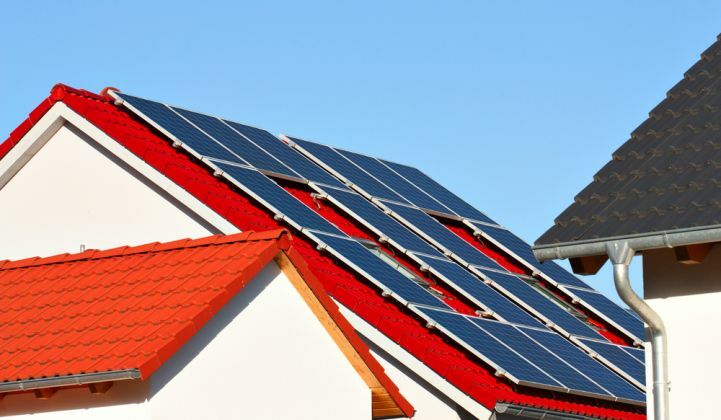 Trends highlighted in the report were derived primarily from project-level data reported to state agencies and utilities that administer PV incentive programs or interconnection processes. In total, data was collected for more than 1.3 million individual PV systems, representing 81 percent of U.S. residential and non-residential PV systems installed through 2017. The analysis of installed pricing trends was based on available installed price data for a subset of roughly 770,000 systems. While there are outliers, overall there is a clear downward solar pricing trend. However, the LBNL report still puts prices well above those found by other researchers. “The pricing figures are just disproportionately high,” said Ben Gallagher, solar analyst at Wood Mackenzie Power & Renewables (formerly GTM Research). WoodMac is currently tracking the full turnkey residential solar system price at $2.95 per watt. Last year, residential solar prices stood at $3.02 per watt. The research firm’s non-residential, or commercial, EPC turnkey solar prices were also significantly lower than those cited by Berkeley Labs. The National Renewable Energy Laboratory recorded even lower solar prices last year. U.S. residential solar PV installation costs in the first quarter of 2017 were stated as $2.80 per watt. Commercial PV installation costs were $1.85 per watt. In early 2017, the impact of Section 201 tariffs on imported solar products had yet to set in. Since the U.S. International Trade Commission's ruling last fall, followed by President Trump’s decision in January, solar PV prices have gone up. Solar marketplace EnergySage tracked residential solar prices at $3.12 per watt in early 2018. That number reflects a $0.07 per watt price increase from September to November, and so far $236.5 million in additional payments from customers versus the pre-tariff trend, according to the company. While the industry lost some ground this year, residential solar PV prices have resumed their ongoing decline. The variance in solar pricing comes down to methodology, which is wonky but important, since pricing trends can inform business and policy decisions. In the cases of WoodMac and NREL, researchers conducted bottom-up cost modeling, which accounts for all system and project development costs incurred during the installation. In NREL’s case, prices are also presented from the perspective of the developer or installer, so they do not include any additional net profit, such as a developer fee. In Wood Mackenzie’s case, however, residential solar figures represent the price to the customer (C&I and utility are tracked as the price to the developer). EnergySage also records customer prices. LBNL used a different approach that relies on historical prices, recorded by state agencies or utilities that oversee solar programs or interconnection processes. The authors note there are some key limitations with this data as a result. For one thing, self-reported installer numbers are susceptible to inconsistent reporting practices. Also, because it’s a historical look, prices may not be representative of systems installed more recently or current quotes for prospective projects. According to WoodMac’s Gallagher, the problem with looking at interconnection data is that it rapidly becomes outdated. The hardware for systems interconnected in 2017 could have been purchased a year or so earlier, and the systems could have been installed six months before interconnection data was generated. As a result, project-level data sets are often “not reflective of current pricing,” he said. “There’s just a proliferation of data issues in project-level data sets, which is why we transitioned away from analyzing them,” Gallagher said. Barbose acknowledged his data isn’t perfect, but stated that other sources have drawbacks too. But the biggest difference comes down to the diversity of systems. “There is just a tremendous diversity in systems out there, and so the median system is not necessarily your plain-vanilla...turnkey type of project,” he said. 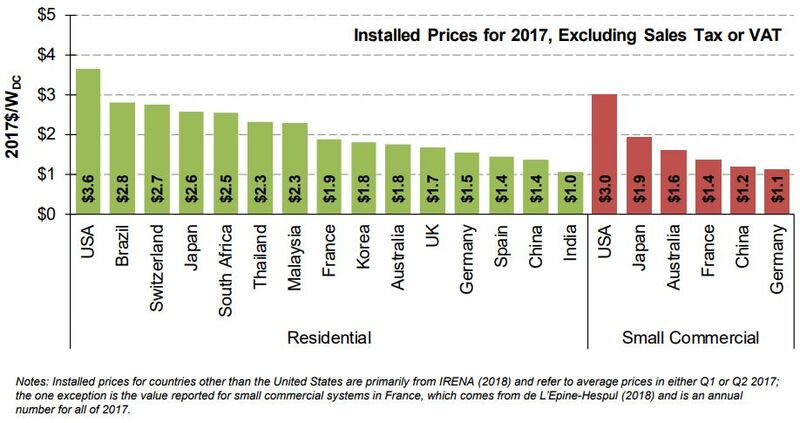 Regardless of which report you’re looking at, one thing is for sure: U.S. distributed solar PV prices are higher than those anywhere else in the world. 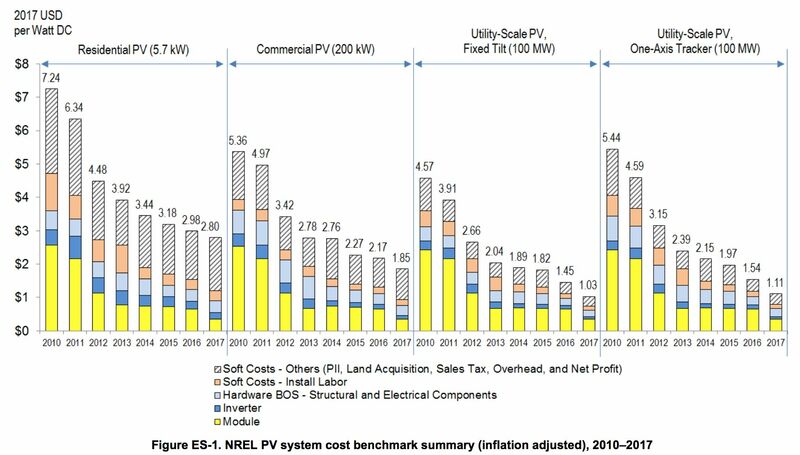 LBNL blamed this on higher soft costs, which are inflated due to solar industry business models, market maturity, labor rates, and the permitting and interconnection processes. The U.S. solar industry is going after that last hurdle through a newly formed permitting initiative. If successful, the effort could slash solar prices significantly.